Too weird for words ? So why are classical musicians honouring Björk ? The Nordic Music Prize is £35,000 worth of prestige awarded to composers, classical artists, the artistic cream of Scandinavia. 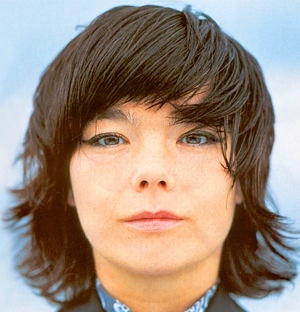 This year it has been won by Björk. The pop world’s bête noire, she is “Miss Weird” who some think rather wonderful, her voice described as a primal scream, her songs as senseless scribblings. Spitting Image sent her up, the police nearly sent her down (she thumped an intrusive reporter) and clubbers nationwide wavered at her wilder sounds. The Nordic judges, though, put their money in her mouth. Hip was to triumph over Haydn. This weekend, she is the subject of a profile by the South Bank Show. Disarming, charming, clad in a Chinese dress and a homespun cardi, she is seen recording her new album Homogenic (“maybe it’s Homogenious—I’m not quite sure of its name ...”) in a Spanish castello with a crew of wonderfully misplaced Icelandic fiddlers. She wants, she says, to capture “the sounds of now”, to somehow paint portraits of her present life and relationships. The result is dark and not entirely friendly ; despite the sun and sangria, her music, raw and frozen still burns through. She is seen on the beach in clothes which might suggest a recent release from Alcatraz, in her front room discussing Stockhausen—she and the mad bad boy of classical electronic tantrums share certain views about banishing the old, embracing the new and surprising. Yet she seems both ordinary and exotic, a misfit among the trappings of her celebrity, a sociable soul most at home at the edge of the world. For more than anything, her music howls the landscape of her native land, to which, after four years in London, she has returned. A month after the Nordic Prize, she was awarded the Knights Cross medal of honour—the equivalent of a knighthood—by the President of Iceland, Ólafur Ragnar Grímsson. “My mum went to pick it up for me. I think the reason why I got it—this is my interpretation, they probably wouldn’t agree—is because I always refuse to play those roles. From day one I would never be an Icelandic ambassador. I always thought the best thing I could do for Iceland abroad, was to do whatever I want— that would be like a presentation of a person that is happy and has freedom. So her music, she says, is rooted in her unflinching Nordic core. Without its slow burn, madness might well lie. “It’s basically just to keep sane. Singing for me is a very physical thing—it really is like sleeping or eating. If I don’t do it for a while I go a bit nutty. Few, though, allow her the mantle of the artist. Yet watch her rehearse—suggest bowings to the strings, discuss vibrato speed and style ; she has in her head a sound—the whine of the north wind, the crack of slate on water, the rip of tearing ice—and with a mix of technique and whirling metaphor, she’ll have her players achieve it. Listen to those wheeling lines, to a phrase which wanders wildly round the bar-lines like an unstable drunk, and hear beneath its extravagance a near-military rhythmic discipline and an uncanny sense of pitch. As one admirer—a conductor of some note—explained “it’s like trick skating— you must be a virtuoso on the straight before taking to the twirls.” For she has, as every artist must, that mysterious mix of intellect and instinct. Brushed with a not inconsiderable dollop of daftness, they’re attributes no doubt deeply uncomfortable in her world of rock where nostalgia rules and originality is less a prize than a tired egg McMuffin. Meanwhile, she says that she’s compiling “a library of sounds—the raw, violent sounds of nature which put you in your place”. Unlike her pioneering folk-loving predecessors—Bartok, Kurtag, any number of Nordic musical explorers—she’ll feed her findings into her computer, not merely hold them in her head. And she’ll continue to do what her fans most adore—give voice with her own peculiar and potent sense of ecstasy. For, as she’ll tell you on Sunday, she makes music for everyone. You just have to join her on the edge of the world.